Lakemont Park Is The 8th Oldest Park In U.S.! 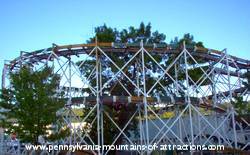 8th Oldest Amusement Park in U.S.
Altoona's Lakemont Park is proud to announce it's the 8th oldest Amusement Park operating in the United States. Built in 1894 Lakemont Park was then known as The Trolley Park. The name came from the use of trolley cars traveling through the surrounding cities as a convenient way to visit the park. Back in the early 1900's the park was popular for it's beautiful picnic areas, dancing at the Casino, it's ice skating, and romantic boat rides around the lake. On cold winter evenings the visitors would build a huge bonfire along the side of the lake and go ice skating under the moonlight. I remember back in the 50s my dad would take me to Lakemont Park to visit their small zoo. They were the first in the area to have monkeys and bears in huge cages in the one section of the park. There was a small bridge across the lake that led to a small cave that always fascinated me. My dad told me that was where the bears would hibernate during the winter months, and of course I believed him. After all, would my dad make up a story like that? Lakemont Park was also one of the first to build a public roller skating rink. Kids would come from miles around to take a spin on their rented roller skates. They built a beautiful Blue Island Swimming Pool, the Amusement Rides started increasing year after year, and the rest is history. 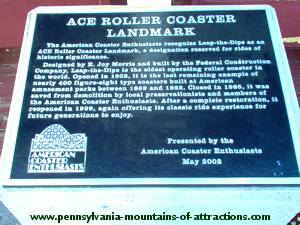 Lakemont Park has always been Blair County's favorite Pennsylvania Amusement Park. Visitors come from surrounding states like, Maryland, Ohio and West Virginia to enjoy old fashioned amusement park fun year after year. Make sure you read about Lakemont Park's Side Traction Roller Coaster, it's the oldest wooden roller coaster in the world, and it is still in operation! It has won awards as an Historical National Landmark. By the 1980s the county owned Lakemont Park was starting to look a bit shabby. They lost their small zoo and roller skating rink. The Pennsylvania Amusement Park was running into financial trouble. Boyer Bros. Candy Company made an offer to the county to build a theme park and the dream of Boyertown U.S.A. was born. Boyer Bros. Candy Company had built a candy factory in Altoona, PA back in the 1940s. The business started making candy in the 30s at the height of the Depression. Mrs. Boyer started making homemade fudge and nut raisin patties to help support the family during the Great Depression. One of her sons wrapped the candy and the other son would go around the Altoona, PA neighborhoods and sell the homemade candy bars. Over the years the Boyer Candy became famous and in demand across the United States. The now famous Boyer Mallow Cup actually started out as nothing more than a marshmallow dipped in chocolate and formed into a bar. Boyer Bros. dream was to make a huge theme park that would bring tourism into the Allegheny Mountains. The company invested millions remodeling Altoona's favorite Pennsylvania Amusement Park. They bought new Amusement Rides and even built a beautiful camping area. The dream was to have a theme park very similar to Pennsylvania's famous Hershey Park. They even built a new building, then moved some of their equipment to show tourists how Boyer Candy was made. In 1986 the new Boyertown U.S.A. opened its doors, with great expectations. The Mallow Cup Mascot was waiting at the gates. At first it seemed to be a great success. The novelty soon wore off and the local people weren't thrilled to pay an entrance fee every time they wanted to enjoy a Pennsylvania Amusement Park. The tourist were trickling in but not enough to cover the expenses. Sadly Boyertown U.S.A. had little choice but to sell the park in 1988. It actually took awhile before the community started returning to Lakemont Park. The free admission and free parking was reestablished. 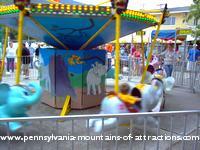 The community was happy to have its Pennsylvania Amusement Park back again. The new owners were happy to buy a beautiful remodeled park. Except the new owners had a few snags they had to work out. One of the snags was putting the Historic Worlds Oldest Roller Coaster back together. Since it was an Historic Landmark it actually turned out to be a big deal. Because of the age of the Pennsylvania Amusement Park Landmark it was hard to find someone experienced enough to tackle this job. Another problem was the the Camping Area. It was taking up a huge area of the park that was valuable real estate. So this entire area had to be reconfigured for better land investment. It took some great management and timing to get Lakemont Park to where it is today. You can now enjoy a beautiful Island Water Park with huge Waterslides. Along with over 30 Amusement Rides. There is also a Miniature Golf Course and Galactic Ice (a new ice skating rink). Of course they still have the beautiful Lakemont Lake. Where you can spend a relaxing day floating along on a Rented Row Boat, or get some exercise and rent a Paddle Boat. The ducks have always been a favorite attraction at this Pennsylvania Amusement Park. I've never seen a kid that didn't enjoy feeding or chasing after them. Lakemont Park keeps expanding and offering new and different attractions through the year. Read about the annual Thursday night Wing Off Contest and Jazz Concert. During the winter months and the holiday season you can enjoy the famous Lakemont Parks Holiday Lights On The Lake. You might be interested to know about the disagreement between the county and Lakemont Park in 2005 over the Keystone Country Festival and how the community pulled together to protest. Lakemont Park started a new fall festival in 2005 called "Altoona First Festival". 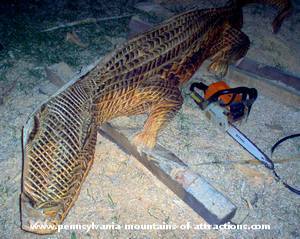 Read about it and see pictures of this popular Fall PA Attraction.